Deciding where to stay during your Hilton Head vacation can be a bit confusing if you don't have a general understanding of the various resort communities and the hotels located in and around them. Designed following the model of the Sea Pines Resort, the first planned resort development on the Island, eleven gated communities or ​plantations, as well as several un-gated neighborhoods provide an array of accommodations, services, and recreational facilities. Many of the resort communities feature on-site golf courses and tennis facilities, beaches, shopping areas, restaurants, and a combination of private homes, rental properties, and hotels. Some of the communities cater to vacationing visitors, while others focus more on permanent or part-time residents. Developed in 1956 by Yale graduate Charles Fraser, The Sea Pines Resort established the first eco-planned resort destination and the model for upscale resort communities in the United States. From the beginning, Fraser determined that at least 25 percent of the resort acreage would remain undeveloped and none of the buildings would surpass the height of the tallest magnolia or oak tree. Other resort developments by Fraser include Kiawah Island Resort and Amelia Island Plantation. Extensive accommodations include villa and vacation home rentals as well as the upscale 60-room Inn at Harbour Town. More than 20 restaurants, bakeries, snack shops, and other dining options are available. 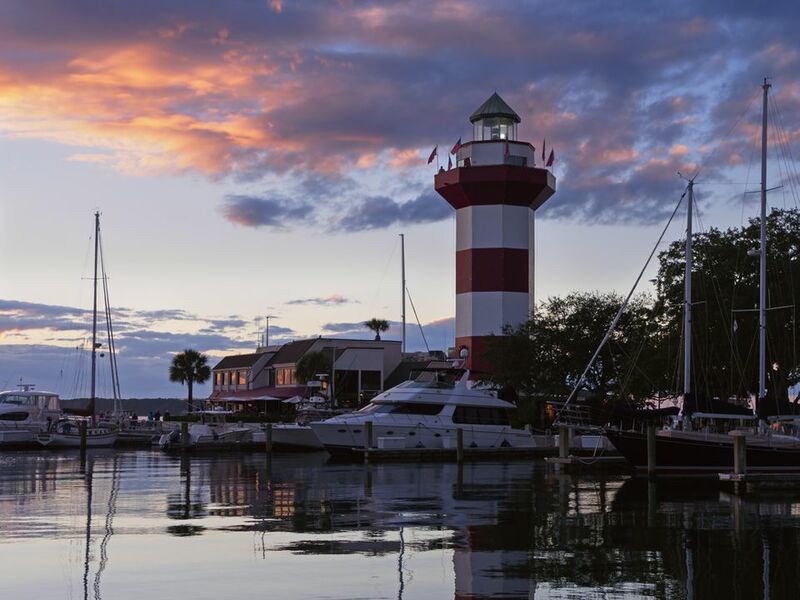 A few highlights are the Harbour Town Grill serving continental cuisine; Surfside Grille, the Island's only open-air oceanfront restaurant; Salty Dog Café, one of Hilton Head's most popular seafood restaurants. Palmetto Dunes is a 2,000-acre resort, conveniently located mid-island with three miles of Atlantic Ocean beach, three top-rated golf courses, award-winning tennis facilities, an 11-mile system of peaceful lagoons, lush landscaping and picturesque paved bike paths. Shelter Cove Harbour features the Island's largest deep-water yacht basin and is the resort's center for boating, water sports, and excursions. In addition, Shelter Cove shopping, restaurants, seasonal entertainment, and fireworks are popular with visitors. The Palmetto Dunes Buggy offers courtesy transportation within Palmetto Dunes and Shelter Cove. The Dunes House, a public access beach facility, includes a deck, resort beach restrooms, and limited parking for resort guests. Swimming Pools - 28 swimming pools are located throughout the Palmetto Dunes Resort. On-site dining options are available throughout the Palmetto Dunes Resort at the hotels, golf course clubhouses, shopping areas, and more. A few popular restaurants include centrally located Alexander's at 76 Queen's Folly Road, Conroy's at the Marriott and Mostly Seafood at the Hilton. Also, as mentioned above, Shelter Cove offers a number of popular restaurants. The Forest Beach area, with three miles of prime beaches, is conveniently located between Sea Pines Resort and Shipyard Plantation. Most properties in Forest Beach are only a short walk or bike ride to the popular Coligny Plaza, which offers shopping, restaurants, movies and free seasonal entertainment. Other family-friendly attractions include miniature golf and a water park. Forest Beach offers a variety of villas, condos, and houses, including many oceanfront or ocean view choices. The Holiday Inn, located on the beach and adjacent to Coligny Circle, is a popular gathering place and a favorite choice of visitors who like to be in the center of the action. In addition to the restaurants of Coligny Plaza, there are several restaurants at the Holiday Inn, including the very popular beachside Tiki Bar. 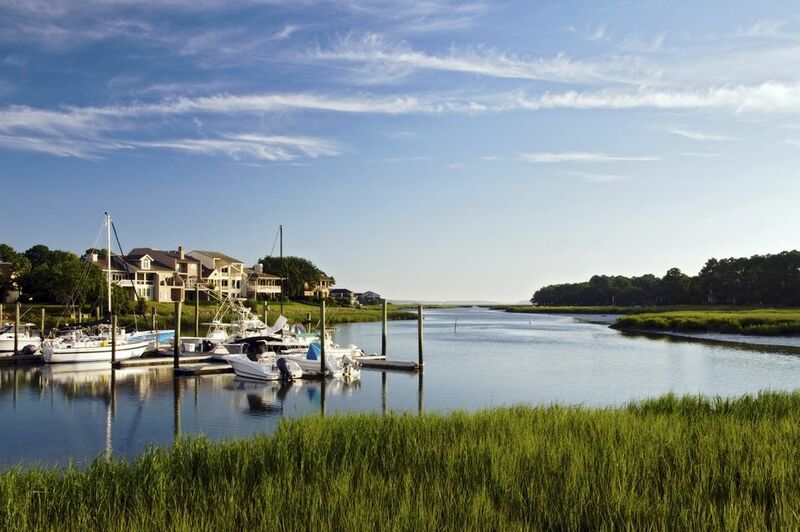 The Port Royal Plantation resort community is located along the northeastern curve of Hilton Head Island and borders both the Port Royal Sound and the Atlantic Ocean. Known as a quiet and peaceful area, Port Royal Plantation was the second resort community developed on Hilton Head Island. Special features of the Port Royal area include pristine beaches, three championship golf courses and the award-winning tennis complex of the Port Royal Racquet Club. Shopping areas with boutiques, galleries, and two large grocery stores are conveniently located nearby, as is the Hilton Head Airport. Other nearby attractions include the Coastal Discovery Museum and Adventure Cove, a popular Caribbean themed amusement center that features 2 18-hole miniature golf courses and an arcade. Port Royal accommodations include villa and condo rental properties, which are separated from the private gated residential community of Port Royal Plantation. The Westin Resort and Spa, located beside the beach and adjacent to the Port Royal Racquet Club, features an Old South ambiance and is one of the top-rated hotels in South Carolina. Shipyard Plantation is an 800-acre gated resort community, centrally located adjacent to North Forest Beach near the Coligny Plaza area. Offering a serene setting amidst moss-draped live oaks, Shipyard is perhaps best known for the Van der Meer Shipyard Tennis Resort, one of the top-ranked tennis facilities in the world. For beachgoers, there is a small access point and a beach club at the northeastern edge of the resort property. For golfers, the Shipyard Golf Club, the former home of the Hilton Head Seniors International, offers 27 holes of golf. Other features of Shipyard include miles of biking trails and a picturesque lagoon system. Shipyard Plantation visitors may choose from an array of rental properties or the Sonesta Resort Hilton Head Island, located on Shipyard's small stretch of beach, adjacent to both the tennis center and the golf club. Besides the several restaurants located in the hotel, there are many dining and shopping options within close proximity to Shipyard at Coligny Plaza, Harbour Town, and Shelter Cove.